In 2004, President George W. Bush announced the aim of promoting a broader “Ownership Society,” in which more Americans could benefit from owning a home, retirement accounts, and other financial assets. “If you own something,” he declared, “you have a vital stake in the future of our country. The more ownership there is in America, the more vitality there is in America.” President Bush’s premise echoes ideas advanced by virtually all presidents since Franklin Roosevelt. Decades of evidence suggest this premise is correct: Asset ownership generally improves the well-being of families and provides an irreplaceable rung on the ladder to a stable place in the middle class. Even so, the share of households owning a home or other assets has fallen over the last decade, particularly among vulnerable groups like African-Americans, Hispanics, and millennials. To revive upward mobility and safeguard the “American Dream” of a secure middle-class life, reversing this trend is essential. Households accumulate assets to prepare for retirement, as well as for lumpy expenses like college tuition and medical bills. Accumulated savings are the most important funding source for startup businesses — and the decline in asset ownership arguably helps explain a puzzling downtrend in startup activity. Asset holdings also serve as a “buffer stock” enabling families to smooth spending over time in the face of ups and downs in their income. Asset ownership is especially important to middle-class families in the United States compared to other economies, in view of America’s relatively modest government safety net. Social Security, for instance, replaces only about 40 percent of a median individual’s earnings during her retirement years, or 30 percent for someone earning about $100,000 – less than in most European countries. Middle-class families also encounter much higher tuition bills and health expenses than peers elsewhere. Studies show that even a small savings stock makes a big difference to the well-being of lower-income families experiencing a financial setback. The evidence also suggests that, for most families, home ownership brings considerable benefits. Ownership is, first, a hedge against rising housing costs. Having such a hedge has turned out to be pivotal to American households over the last two decades. New construction of rental units aimed at lower-income families has languished far below the pace seen in the late 20th century, adjusted for population size. In part because of this supply constraint, median rents have surged 32 percent in constant dollars since 2001, while median real wages have barely budged. More than 40 percent of America’s 44 million renter households are now “rent-burdened,” as the government defines it — spending more than 30 percent of income on housing — while a quarter spend more than 50 percent. Home ownership also promotes household wealth-building. In theory, a family could always rent a home and redirect the money they would have spent on a down payment and mortgage principal payments to stocks and bonds. In practice, careful studies in the U.S.and other countries have shown that homeowners accumulate greater net wealth over time than otherwise similar renters. One reason is that required payments on a mortgage effectively force homeowners to build equity in their home over time, overcoming some of the behavioral challenges in the way of wealth accumulation. Another reason: while typical appreciation in house values after taxes and maintenance is relatively low, homeowners can and do borrow most of the cost of purchasing a home, which they can’t do with liquid assets. Net returns on a homeowner’s 20 percent down payment are at least equivalent to returns on a portfolio of stocks and bonds, on average. 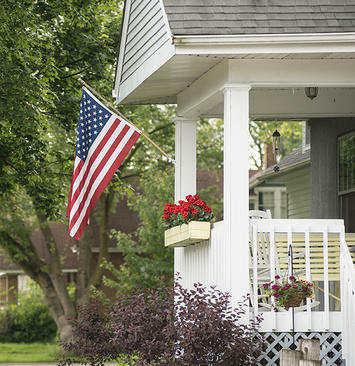 It’s not surprising, then, that 87 percent of Americans continue to view home ownership as part of the American Dream. According to another survey, 90 percent of young renters wish to buy a home someday, defying the myth that millennials value ownership less than previous generations did at the same age. African-Americans and Hispanics are even more likely than white Americans to aspire towards home ownership, a Harvard study found. When a family owns their home, benefits spill over to the wider community. A variety of studies demonstrate that neighborhoods with high home ownership rates experience higher civic engagement, less resident turnover, greater property appreciation, and less high-displacement gentrification. The whole neighborhood derives value from the financial and “sweat-equity” investments homeowners make in their homes. It’s recently become fashionable to argue that the financial crisis of 2007-2009 discredited the “Ownership Society” as a policy aim. According to critics, Clinton- and Bush-era policies to promote home ownership were destined to fail and, moreover, fueled the financial sector excesses that spawned the crisis. This argument represents a lazy and indefensible misreading of the record. The housing crash proved that the disastrous pattern of housing finance that emerged between 2004 and 2007 — no-money-down “liar” loans, dishonestly-rated securitization structures, and the whole miasma of self-delusion and fraud depicted in Michael Lewis’s The Big Short — was bound to end badly. But it doesn’t follow that lower-income families are incapable of responsible home ownership. Ownership rates were almost as high in the U.S. during the 1960s as they were at the peak of the excesses in 2005, with no housing crises. Also, bad lending to commercial real estate developers — including builders of rental housing — has sparked far more banking crises in history than lending to homeowners. Bad lending coupled with under-capitalized banks caused the crash of 2008, not home ownership as such. Finally, critics of home ownership fail to consider that a rental-dominated market would confer tremendous market power on large landlords, reinforcing what author Joel Kotkin refers to as “lord-and-serf” dynamics and driving inequality higher. The only alternative would be rent control, which would devastate already-anemic construction activity and create growing housing shortages. The home ownership rate declined from a peak of 69.2 percent of households in 2004 to a 50-year low of 63.1 percent in 2016, bouncing back slightly last year. The decline has been especially severe among African-Americans, Hispanics, people without a college degree, and millennials. As of 2015, ownership rates among both the 25-34 and 35-44 age groups were more than 10 percent lower than for the same groups three decades earlier. The U.S. was once an international leader in home ownership rates, but now ranks 35th out of 44 advanced countries. Likewise, enrollment rates in 401(k) plans and other tax-advantaged retirement programs have declined considerably since the 1990s for African-Americans, Hispanics, and young adults. Only 52 percent of Americans in the middle income quintile — and just 31 percent of the lower-middle quintile — had money in retirement accounts as of last year. The net wealth, after household debt, of middle-income Americans has deteriorated recently as well. According to a 2017 Pew Research report, median net wealth for middle-income white, African-American, and Hispanic households has fallen 19 percent, 38 percent, and 46 percent, respectively, over the last decade. A new study by the Federal Reserve Bank of St. Louis estimated that the accumulated assets of the median household “headed” by a 35-year-old are running 40 percent below the level one would expect at this stage based on the experience of earlier generations. Why has asset ownership fallen so much, particularly among middle-income families? The chief factor accounting for declining home ownership rates is, almost surely, the fact that house prices have been at sky-high levels by historical standards, both before 2008 and again over the last five years. Ownership rates actually fell from 2004 to 2007 despite the wild excesses of housing finance during those years, because houses became so unaffordable. As for retirement assets, the existing system is failing all too many middle-income households. People find it too easy to withdraw account balances and too difficult to port accounts over to new employers, which means a substantial minority of enrollees have virtually nothing in their accounts. The share of smaller employerswho even offer a 401(k) plan has fallen considerably over the last two decades, to less than half. For millennials, one more impediment to asset accumulation is the millstone of student debt. Outstanding student loans have exploded upwards from under $400 billion in 2005 to $1.5 trillion today. Providing a “hand-up” to help lower-income people onto the first rung of the ladder to stable asset ownership is one of the most powerful engines for upward mobility and a sustainable middle class. • Taxing land more heavily and structures more lightly to induce development. To promote asset accumulation in retirement plans and other savings accounts, Congress should replace today’s heavily-regulated, burdensome mix of retirement mechanisms with a single system of easily portable, tax-advantaged “universal savings accounts,” with far higher contribution limits. President Bush pushed unsuccessfully for such a system in the early 2000s, and numerous such proposals are circulating today. Government at all levels should stop penalizing savings in determining eligibility for means-tested benefit programs. They should also consider innovative experiments in matching contributions by lower-income families to savings vehicles. One example is the promising “Individual Development Account” program, which helped low-income savers to more than triple their savings relative to a control group in a randomized trial last year sponsored by the Urban Institute. The federal government should overhaul the disastrous student loan system to reverse the rapid buildup of indebtedness, which today renders the dream of wealth-building an unreachable fantasy for millions of young Americans. And policymakers should do all they can to foster the emergence of cheap, technology-enabled, no-conflicts financial advice to middle- and lower-income people – which is almost impossible to provide in the over-regulated and conflict-ridden financial services environment of today. President Bush was right in 2004, and his vision of an “Ownership Society” is more valid than ever in 2018. Building asset holdings is one sure way to bolster America’s middle class. This piece originally appeared in The Catalyst, a journal of ideas from the Bush Institute. J.H. Cullum Clark is Director, Bush Institute-SMU Economic Growth Initiative and an Adjunct Professor of Economics at SMU.